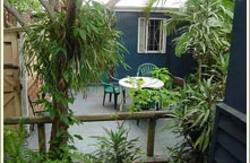 Brisbane City's friendliest backpackers hostel with the best location! We are the 2nd closest hostel to the Brisbane Transit Centre (less than 5 minutes walk) and just 2 mins walk from the closest supermarket. We offer awesome dorm rooms with high angled ceilings and plenty of space as well as ensuite rooms. Some rooms are air-conditioned, some cooled with ceiling fans. All of our bathrooms are spacious and clean. We have super comfortable beds, friendly and helpful staff, funky colours and lighting and rooms with awesome River and City views. Our prices are generally a few dollars cheaper than other older City Hostels which are further away from the Transit Centre. 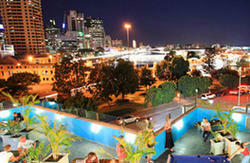 We are close to Brisbane's major nightlife and cafe areas. 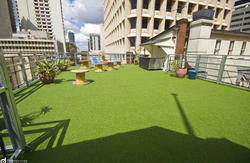 Our facilites include coin operated internet, laundromat, kitchen, pay phone, TV lounge with DVD's, Travel and tours desk, and a roof deck with million dollar views of Brisbanes river and City skyline. Our environmentally friendly design features highly insulated walls and ceilings for both temperature and noise, natural lighting and ventilation, 45000 litres of rainwater storage to save on water resources, solar-integrated electrical system and our green rubbish recycling program. We also offer baggage and personal valuables storage. Cloud 9 features state of the Art security with a digital monitored camera system, 24 hour security and Night Management, and electronic swipe card access for every Guest Room. We'll even help you find a job! Please note that Cloud 9 is a licensed premises and therefore under Queensland Liquor Licensing laws we cannot accommodate under 18's. backpack and passport to be checked into one of our shared dorm rooms.